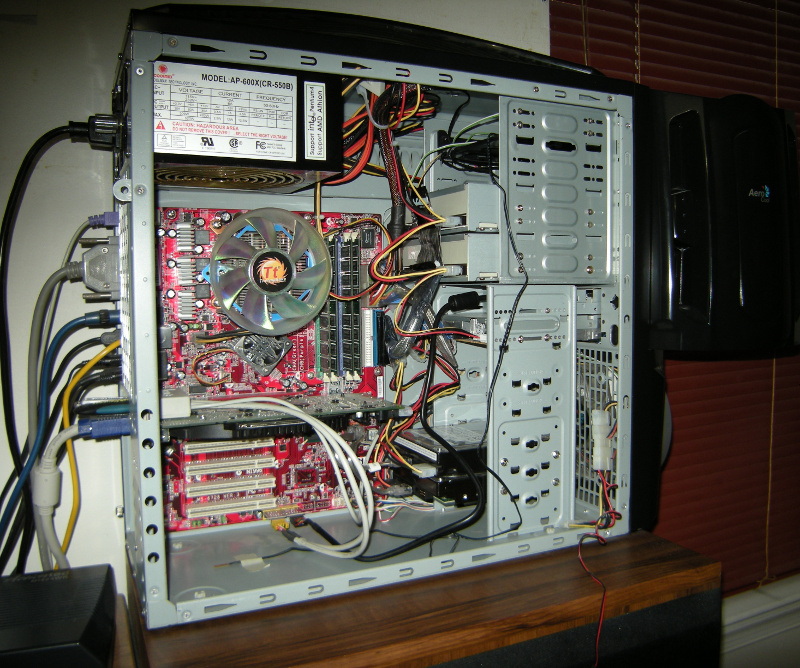 Built in late 2004, rebuilt after a traumatic series of RMAs in early 2005, and reconfigured after a Windows meltdown in summer 2008, this unlucky Pentium 4 box was serving as my workhorse PC in January 2011 when it died yet again. 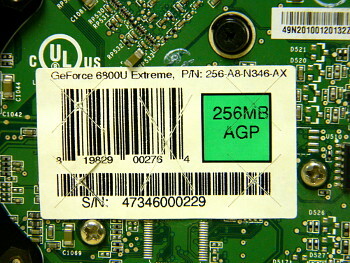 An electrostatic discharge (ESD) to the conductive cover of this ungrounded hard drive enclosure travelled through the USB cable into the back panel of the MSI 865PE Neo3-F motherboard, killing it. The motherboard helpfully included a D-Bracket diagnostic feature with indicator lights to indicate precisely where in the boot process things were going pear-shaped. After the shock, it consistently halted at "Early Chipset Initialization." The manual stated that a bad CPU would not get past "System Power ON." 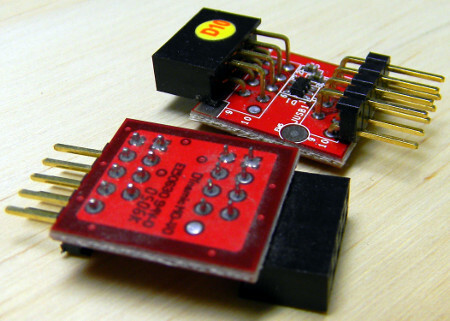 Death by ESD delivered via USB ports was a common problem with the i865 chipset. The second MSI motherboard that went into this PC (after the RMA of the first) came with these "surge protector" retrofits in the USB headers. Unfortunately, that was not the path that the shock took. Upon removing the PSU, I happened to notice that a bad cap had erupted in it. 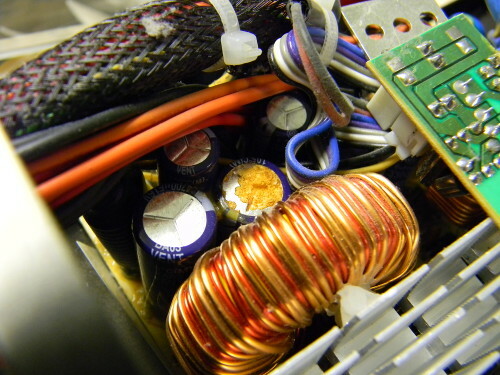 If I recall correctly, that capacitor had a hint of corrosion on it when the PSU was new, but it was not so obvious a problem as to cause this naïve consumer to return it immediately. The PSU was in service for six years and was not clearly implicated in any failures. Fearful of losing Windows 98 compatibility if I changed the hardware too much, I sought out a compatible replacement for the dead motherboard. Unfortunately, the combination of 4 GB DDR memory, AGP graphics, and LGA775 CPU was supported by only one chipset: 865PE. The same MSI board was not available from anywhere. 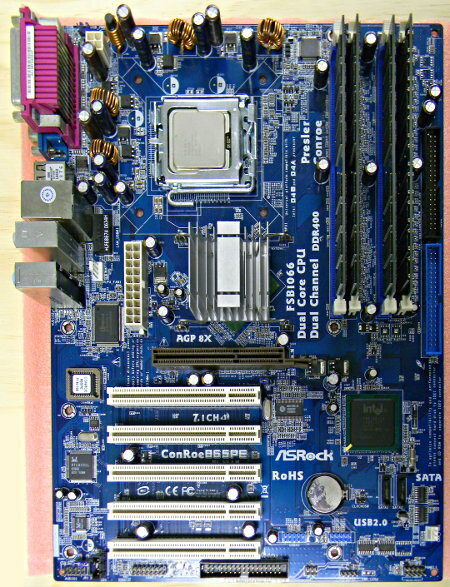 The closest reasonable substitute I could find was an ASRock ConRoe865PE R3 for $34.97 ($26.98 plus shipping). Grumble. But it was the right chipset at the right time. Relative to the MSI motherboard, I gained a game port header, a fanless northbridge, and compatibility with some newer CPUs. I lost the digital audio output, gigabit ethernet, and D-Bracket. Losing digital audio was the real bummer, as I never could get decent sound from AC97 analog outputs. I stepped "down" from a nominally 550 W PSU (the biggest in its series in 2004) to a 500 W PSU (the smallest one in the Silencer MKII series now). According to the labels, the maximum load on +12 V went up slightly, the maximum load on +5 V dropped by half, and ISA compatibility (−5 V) went away. My original power budget was overly conservative hogwash. The actual peak load measures around 225 W.
Behold, the AeroRacer Pro and its 40 cm fan—the logical last salvo of the fan size war. I had always wanted to see if this was a practical configuration. It appears to be; there's enough turbulence that dead spots are not a serious problem. The fancy shmancy tool-free retaining mechanism for add-in cards didn't keep my graphics card from sagging. I had to rip out that plastic crap to get access to install plain old screws, which fortunately was still possible. The game port bracket (with gray ribbon) was salvaged from a 486, but that's one obsolete part that is still cheap and widely available. 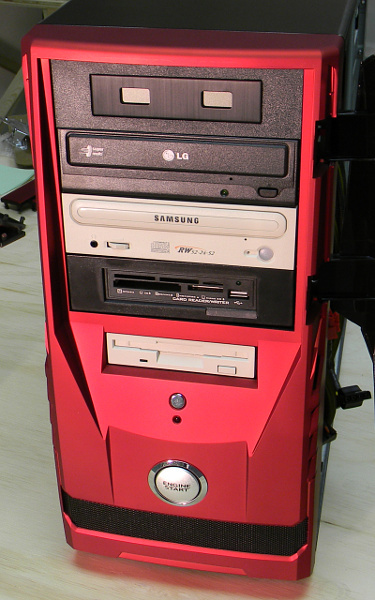 Life is too short to make the colors match, but another external 3.5″ drive bay would have been nice. This time I installed Intel's original cooler in hopes that it would be quieter than the Thermaltake Silent 775, which was plenty quiet in bench tests but reverberated once installed in the case. The 4-pin stock fan does run slower when the CPU is idle, but the improvement in acoustics is nothing to write home about. The CPU is one of the cooler Prescotts with an 84 W TDP. With the side fan blowing on it, a passive heat sink might have sufficed. 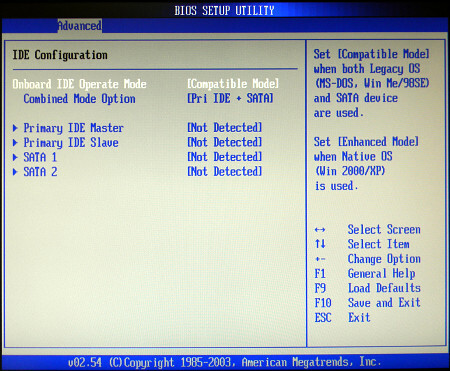 I configured the BIOS settings as much like the old motherboard as was possible, crossed my fingers and started booting. Windows XP spent a long time updating its drivers and left me with a hosed network connection, but after I installed the driver provided with the motherboard (for better or worse) and then fixed the actual problem (which was DHCP), everything was OK.
Windows 98 SE went into a fit of finding new hardware and apparently hung. However, it wasn't hung; it just didn't have the driver for the USB keyboard installed. 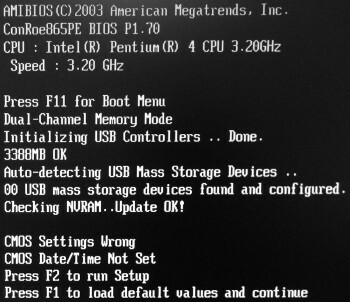 After connecting a keyboard to the legacy PS/2 connector, I was able to get through the installation of the USB keyboard and mouse with the Maximus Decim generic USB driver, and then everything was back to normal. Testing the gameport with a Y-cable revealed that the buttons on the second joystick were nonfunctional. 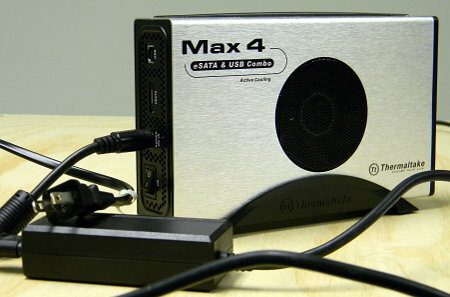 Relevant pins had been hijacked for MIDI, just like on sound cards. 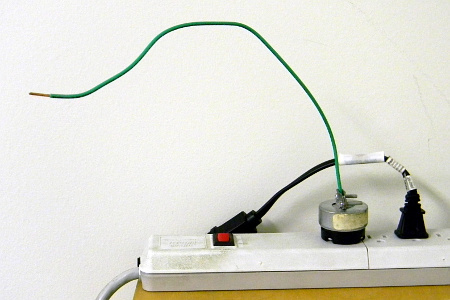 Belatedly, I realized that I had neither a case speaker nor a mount point where one was obviously meant to go. Another standard legacy feature had been quietly discontinued when I wasn't paying attention. As a substitute, I got this little bleeper, which lays forlornly on the bottom of the case and makes pathetic, buzzy little bleep noises. In the process of reaching through the crowd of wires to plug it in, I accidentally caused the SATA cable to the boot drive to develop a bad connection, and the opposite of hilarity ensued. 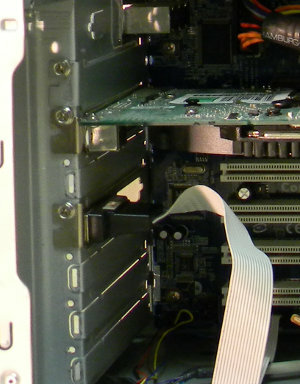 Darned non-clipping SATA headers. The resurrected PC spontaneously rebooted while I was fumbling with a USB flash drive. At that point it suddenly seemed prudent to salvage and reinstall the USB header retrofits from the old motherboard. 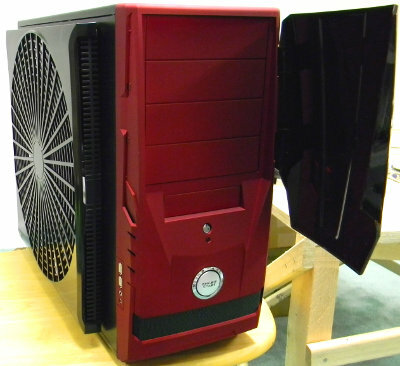 While I was messing with this 2004 PC, the most coveted graphics card of that year, a GeForce 6800 Ultra Extreme, coincidentally appeared on EBay. Tired of being outbid on less desirable cards, I went big. Unfortunately, there was another nostalgic fool (or a shill) in the bidding that week, and the price rose to within cents of my overly generous limit, just over $100. When they first appeared in 2004, the only way to get an Ultra Extreme was in a lottery from EVGA. When they did go on sale generally, supplies ran out before any significant price-drops occurred. The 6800 GT, 6800 Ultra, and 6800 Ultra Extreme were just different speed bins for the same GPU core. 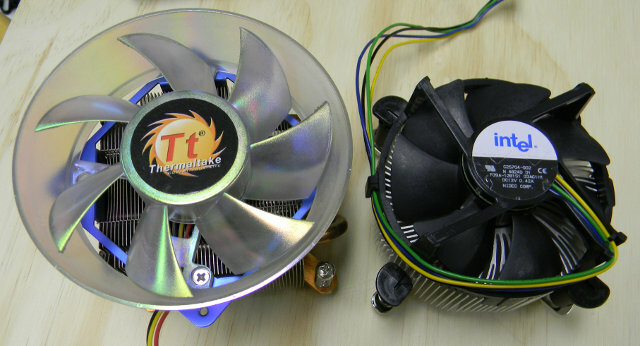 GTs and Ultras overclocked to 450 MHz and beyond were relatively common. This sticker is the only thing distinguishing my purchase from a good Ultra with a flashed BIOS. Despite the nomenclature, the 6800 series was not to be the ultimate for nVidia AGP. That title went to the AGP-bridged 7950 GT, which would outperform a 6800 Ultra Extreme by a significant margin if it worked. 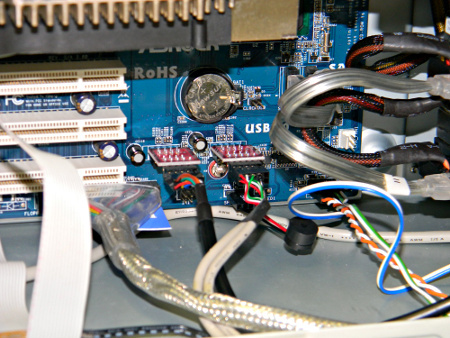 However, many users reported lock-ups due to compatibility glitches with the AGP bridging, and on a 32-bit PC the 512 MiB frame buffer rendered an [even more] ludicrously large chunk of high memory unusable. XFX, Leadtek, and Axle all made 7950 GT cards with two DVI connectors. 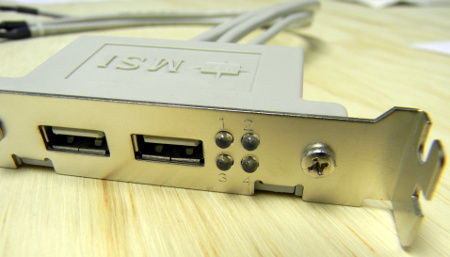 Later, Galaxy made them with one DVI connector and one analog VGA connector. 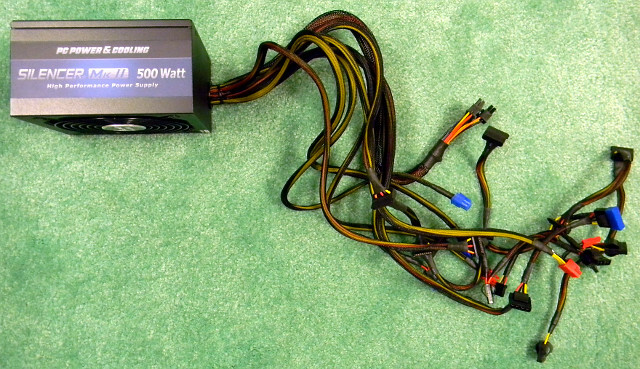 All of the above had a single Molex power connector. The [ostensibly] 7950 GT pictured below, seen on EBay circa 2011-02, is a concoction by a manufacturer who apparently doesn't want to be identified. Be afraid?